February 4, 2016, 11:33 AM · At 82, the legendary composer Krzysztof Penderecki never tires of producing music, nor globetrotting. This year's Storioni Festival, an 11-day celebration in the Dutch province of Brabant, staged compositions covering every period of the composer’s development, from early experimental to later tonal, neo-Romantic works. "It is always eye-opening -- or ear-opening -- to hear my works performed in yet another location," Penderecki said. "I thrive on inputs, involvement and artistic action. The Storioni Festival gave me the chance to experience a retrospective -- very beneficial as a new composition (octet) takes shape." Krzysztof Penderecki. Photo by Ben Bonouvrier. Commenting on "Capriccio per Siegfried Palm," a flashy solo cello piece performed at the festival, the maestro reminisced, "I studied violin for many years and, like all instrumentalists, try to push the boundaries of what the instrument can do." Monika Leskovar, the brilliant cellist whose emotionally charged communion with the work brought down the house, observed, "Penderecki’s score is so precisely annotated that the meaning behind the music unfolds once the notation is mastered." "I do not like titles that define a work of art, of free will," Penderecki said. "Composers revolve in a world between notation and sound, inspired by the latter to put the former to work. I consider all of my music, even the minimalistic works, to be somewhat romantic or at least tied to emotion. My motivation to compose a piece comes from an urge to combine harmonies, rhythmic patterns and specific sounds that give intrinsic meaning to how I feel, I perceive the world." No fewer than four composer-artists took center stage at Storioni 2016: the distinguished Penderecki as composer-in-residence; the American-Dutch composer Vanessa Lann as commissioned featured artist, and the hip performance artists-composers-instrument makers, Marco Mlynek and Aart Strootman, whose novelty hurdy-gurdy and harp lute reconstructed from Hieronymus Bosch's vibrant canvas figured prominently in their five-part extravaganza, Heavenly Hell. The theme of this year's Storioni Festival was "Dreams & Demons," drawing inspiration from the surrealistic cosmos of local genius, the artist Hieronymus Bosch, 500 years after his death. Enthusiastic at the prospect to create her first piano trio with Bosch’s hellish hallucinations as a point of departure, Lann spoke persuasively about the roots of her inspiration for her composition, "Big Picture," which was commissioned to celebrate 20 years of the Storioni Trio. Lann, who trained at Harvard in film theory and physics, was infatuated by composition from a young age, and she pursued post-graduate studies with Dutch luminaries Louis Andriessen and Theo Loevendie. "There are so many repeated images in the Bosch triptych, that I’ve attempted to repeat elements in the three main movements of the piece, first in one instrument and then in the other two," Lann said. "In the first movement, the violin serves as a background element, playing with mute, without vibrato and with slow patterns in a soft dynamic. When the same exact notes return later, the violinist is in the foreground, playing with much vibrato and a much louder dynamics. Throughout the piece the cello echoes the lines of the violin yet it sounds different as the cello has another timbre. It brings up the question of what on what instrument sounds heavenly can simply be hellish on another. " Painstaking preparation precedes all rehearsals for the Storioni Trio, no matter which piece of repertoire is on the stand, but working with a composer who really knows what she wants calls for extra preparation on the part of performers. The technical complexity of Lann’s piece called for scrupulous dissection to reach the explorative, interpretative phase. The Storioni Trio. Photo by Ben Bonouvrier. 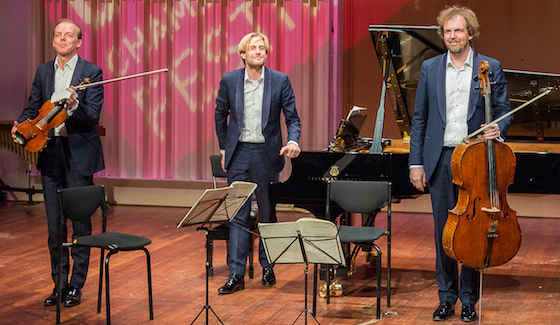 "It might help that we know each other well," said Storioni violinist Wouter Vossen referring to the longtime collaboration with his brother, cellist Marc Vossen and pianist Bart van de Roer, "yet even after two decades of music-making, we realize that the more we come prepared to rehearsals as individuals, the better we can apply ourselves and ultimately let go once we are on stage." Lann’s music is replete with special effects that call for an openness to experimentation and modification. Even the most visionary composer needs to learn how the instruments can be used to their best advantage. "The secret is really not a secret," Lann said, "it involves finding a technical way to achieve the sound in the composer’s mind." Lann discovered that heaven and hell can find aural expression through artificial and natural harmonics, and that there can be a special importance to unusual, repeated bowings. Technique thus becomes a flexible means to an end, keeping in mind that the composer will have to let go as the performers take over on stage. Two rehearsals of Lann's work brought members of the Storioni to the realization: the boundaries between visual arts and music are indiscernible. Listening to Lann's composition, "the audience will find some of the repeated patterns as strange as the images in Bosch’s painting," Vossen said. "Yet, once the piece nears completion, all of the musical gestures make sense. They grant a role to the listener: to see what he or she notices, just like different people pick up on different things when looking at a visual image." The musical juxtaposition between foreground and background gives each instrument the chance to become a part of a "bigger" picture. 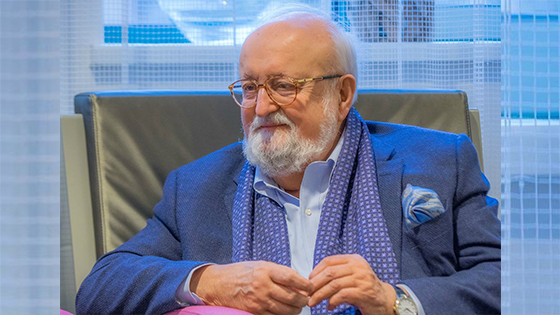 At Storioni 2016, Krzysztof Penderecki and Vanessa Lann agree wholeheartedly: "There is no greater feeling than having your work come to life through a group who loves what they do."